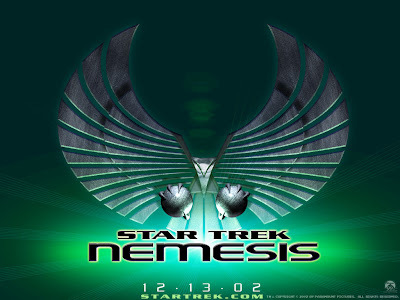 The movie “Star Trek Nemesis” tells about two children who are the same but are born on different worlds. Each experienced different life events which created a different personality for each of them. Captain Jean-Luc Picard is a confident man. He was born and grew up in France in LaBarre with a happy family, though they disagreed with him joining the Starfleet. Picard had spent his youth looking up at the stars, and dreaming of what might be. Although Captain Picard had lost two starships, Stargazer and Enterprise-D, in two different accidents or battles, he would always be a captain of a starship. He is now the captain of starship Enterprise-E.
A replica of Capt. Picard was created by the Romulan government that intended to replace Capt. Picard. The replica was called Shinzon. But, after the new Romulan government got power they were afraid that if the Federation discovered this matter they would get into big trouble. Consequently, they left Shinzon to die as he was a child. Before the new government got power, Shinzon spent a lot of time looking up at the stars dreaming of what might be. After they got power, they sent Shinzon to the dilithiom mine on star Remus with 18 hours labour per day and being thrashed by Romulan guards. But there was a Remus labourer who pitied him and taught him how to survive and protect himself from Romulan guards. Years later, Shinzon become the praetor of Romulan government and that man became his first officer. Although they were made by the same raw material, different life events created different personalities. Picard always thought of himself as an explorer, and he wanted to explore where no one had gone before. But Shinzon thought he was a warrior, and always fought for freedom though he was the praetor of Romulan now. Shinzon needed Picard’s blood to keep alive. Eventually, Shinzon caught Capt. Picard with a transporter from his starship, Scimitar, and directly beamed him from his starship Enterprise-E. Shinzon said he was a mirror of Picard. If Picard lived he would make the same decisions as him. Fortunately, Picard is rescued by a colleague - Lt. Commander Data and returned to the Enterprise. Before the “disruptorplay”, Data suggested Picard escape without him, because his transporter device was used for a single person only. Of course Picard disagreed with this suggestion. As the ship’s captain, Picard had a responsibility to his crewmembers. He could not just run away without his friend who had tried to help him. I think a captain of a starship……or any ship, always has supreme power over his or her crew and ship. He also has supreme duty to his or her crew and ship. But the first duty of a captain and crewmembers is always their ship. According to history, most captains die for his or her duty to the ship. Sailors die by order of their captain……….so, what should be a president’s first duty? This essay will discuss this issue later. If a president does something corrupt, then should he or she die for their country? However, Capt. Picard still doubted what Shinzon had told him. So, if Picard lived in Shinzon’s life and experienced life events the same as Shinzon, Picard would do the same as him? According to lots of scientific research in the 21st century, most bad people have experienced violence, distrust, enslavement, homelessness and rejection from school classmates. Since they aspire to get attention and respect from other people, so they commit crimes, like joining factions, thieving autos, or going to school or other places with weapons, then killing others. So, what does Shinzon intend to do? According to sensor’s log of the starship Enterprise-E, the sensor indicated Shinzon’s vessel is equipped with a radiation weapon called “Thalaron” radiation generator, which able to annihilate a starship even an entire planet in second. So, they think they knew what should be Shinzon’s plan……to destroy Earth. This is very interesting. Did the people of Earth do something wrong? Why does Shinzon intend to annihilate Earth? Why does he reject his humanity? If Picard lives in Shinzon’s life, Picard’s will is teh same as Shinzon? Or if Shinzon live in Picard’s life, will Shinzon be the same as Picard? A long time ago, in the south part of Taiwan, a poor boy lived without his father, and he got lots of sneers from others. However, because of his life events, he decided to study hard. Finally, the poor boy became the president of Taiwan. However during his period of presidency, it was discovered that he had received lots of under-the-table payments. Consequently the morally poor but financially rich president found himself in jail. As a poor boy, he always understood that studying hard is the only way to make a difference. But for the others who sneered at him, they had all that they wanted, so they didn’t understand why they must study hard. Though the poor boy’s life events made him become a president, did this also damage his mind? Did this develop his dark side? And the people who sneered at the poor boy, where are they now? Did they become richer than the poor boy? When they sneered at the poor boy, did they also have responsibility for developing his dark side? Although President Chen lives in the 21st century, if he was born in a happy family would he have still studied hard and been corrupt? Or would he have been like Capt. Picard and been a good president to guide Taiwan to be better than what it is now? Or is the entire population of Taiwan offensive to him? During a break in the “Enterprise Scimitar battle”, Picard told Shinzon that he still had chance to be a better man, and his potential is the same as Picard. But Shinzon claimed that he is fixed by what his life has made him, and unable to modify it. Before the battle Picard had told his doubt to Data. The doubt is that if he got life events the same as what Shinzon has, would his will reject his humanity too? But Data said he aspires to be better than he was. B-4 does not, nor does Shinzon. So, what does Data mean? Though Shinzon got influenced by those bad life events, if he gets a good person to nurture his positive side he’ll be better? Or he must find it individually? After the dark part of this movie, what’s the positive side of humanity? Since Enterprise got photon torpedo and not enough power to fire its phaser. Picard knew what the next steps Shinzon intends to do. Picard asked his helmsman use full impulse of the Enterprise to ram Scimitar, and it disabled Scimitar’s entire disruptor bank. Of course Shinzon got extremely angry, and decides it’s time to use his thalaron radiation, though Picard will be killed by it too. As a captain of starship, Picard has this duty for his ship and entire crew. He grabbed a phaser and asked his chief engineer to beam him into Scimitar. He intended to destroy the matrix of thalaron radiation for the safety his ship and crew. Finally the matrix has been destroyed, but it is destroyed by Data. Why? Is it the captain’s emergency order? Of course not, because Picard went alone without anyone. Altruism, this is altruism. Data sacrificed himself for the safety of the entire crew of Enterprise. Why he did it? Why he doesn’t just sit and wait for his captain to shoot the matrix? Is he thinking Picard’s life weighs more than his? Or it’s an effect of movie? In the reality, certainly some people save other by sacrificing themselves. In Taiwan, many air force pilots sacrificed themselves for safety of others or teachers or cadets as they knew their craft is damaged or out of control, though they had a chance (few second even few minute) to escape with parachute but they chose to pilot their craft out of the city then crash at sea or other wide place. If you want to create your positive side, you need to get a positive environment first. In my opinion, I believe people are always made by self life events but they also can fight with themselves, in they want. Finally, if you meet a rascal, please consider that, if you have a life events the same as them, you may be a rascal too. Space… the final frontier; these are the voyage of the starship Enterprise, its continuing mission, to explore strange new worlds, seek out new life and new civilizations, to boldly go where no one has gone before! Wave：What do we hear? What do we see?